A computer-based, point-of-sale application for secure and reliable payment processing. Use TSYS CounterPASSSM to process credit and debit cards, voids, returns and recurring payments. The user-friendly interface makes navigation quick and simple, allowing you to monitor your revenue in real time, run and download reports or void transactions anywhere, anytime. 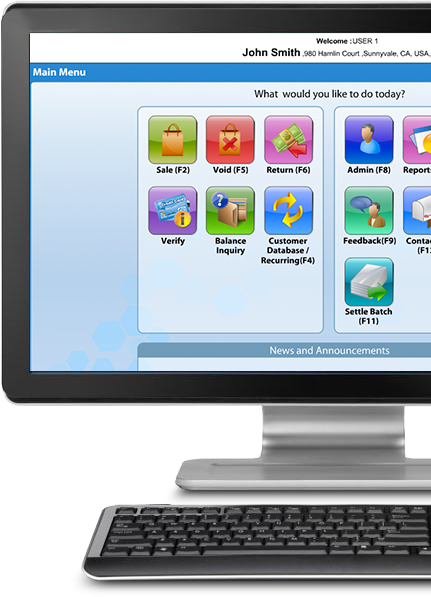 TSYS CounterPASS is a PC-based application used to securely process credit card transactions at the point of sale. TSYS CounterPASS brings all of the functionality of a traditional point-of-sale terminal to any PC, with a multitude of added benefits. What equipment do I need to process with TSYS CounterPASS? A computer that meets the recommended requirements and a high-speed Internet connection. You will also need a card swipe reader, a PIN pad and a printer. Can I keep using my computer for various office tasks or will it exclusively run TSYS CounterPASS? You can use other programs on your computer concurrently while using TSYS CounterPASS. All major credit cards are accepted, including Visa, MasterCard, Discover, American Express, Diner's Club and JCB. TSYS CounterPASS supports both Signature and PIN-debit. Recurring payments, voids and returns are all supported by TSYS CounterPASS. What fraud features does TSYS CounterPASS provide? TSYS CounterPASS provides Address Verification System (AVS), Cardholder Identification (CID) and Card Verification Value (CVV2) verification services. In addition, all cardholder data is stored at a secure host so no cardholder data resides on the PC. A typical transaction processes in seconds when using the recommended high-speed Internet connection. Can multiple employees use TSYS CounterPASS? There is no limit to the number of employees who can process transactions with TSYS CounterPASS. Each employee will be assigned a unique ID and password to access the application. No, TSYS CounterPASS automatically sends batches out every day from the secure host server. A custom auto settlement time can be set by the merchant services provider upon request. Who can I contact if I have problems with my TSYS CounterPASS application and hardware? Your TSYS CounterPASS support team is available 24/7. What devices are certified with the TSYS CounterPASS product? Please see the Compatible Devices section.